I purchased a YS480 for Christmas 2018. I got 3 cooks on it before the Minnesota winter closed down the outdoor grilling. I’m forced to store the smoker outside with a cover on it. When I took the cover off to use it again, I noteced like a 100 tiny discolorations on the paint. It is slightly lighter colored than the original color and slightly raised. I tried washing the surface but they are still there so I’m thinking it is the beginning of rust. How should I prevent future rusting? If it is painting, I’m thinking it needs to be completely refinished. Before I purchased the Yoder I had read about the potential for rust. However, I never expected all these tinny problem areas to develop over 3 months. 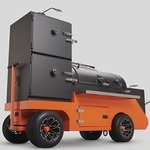 Please contact our Customer Service Team at customerservice@yodersmokers.com so we may properly help you. OK, thanks for the advice. I sent an email with pictures of the paint. I had forgot to mention that there was a narrow vertical, repeating every 3 inches or so raised bump in a line up the fire pit door, too. I included pictures of that as well. [quote="WatchManUSA"]I purchased a YS480 for Christmas 2018. I got 3 cooks on it before the Minnesota winter closed down the outdoor grilling. I’m forced to store the smoker outside with a cover on it. When I took the cover off to use it again, I noticed like a 100 tiny discolorations on the paint. It is slightly lighter colored than the original color and slightly raised. I tried washing the surface but they are still there so I’m thinking it is the beginning of rust. I am having the same issue and they sent me a new lid, but no explanation is given. It has now spread to the hopper box. [quote="WatchManUSA"]OK, thanks for the advice. I sent an email with pictures of the paint. I had forgot to mention that there was a narrow vertical, repeating every 3 inches or so raised bump in a line up the fire pit door, too. I included pictures of that as well. So what was their advice? So what was their advice? They have not given me any.